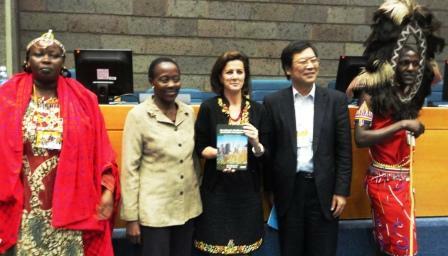 Searching for Resilience in Sustainable Development: Learning Journeys in Conservation, a new book by two UK academics Professor Daniella Tilbury and Dr John Blewitt, was formally launched at the United Nations Environment Programme (UNEP) Headquarters in Nairobi Kenya on 27 November 2013. Professor Tilbury attended the event. The launch, chaired by Mahesh Pradhan (Director of UNEP’s Global Universities Partnerships for Sustainability and Head of UNEP’s Environmental Education and Training Unit), was opened by Dr Elizabeth Mrema (Director, Division of Environmental Policy Implementation, UNEP). The formal yet colourful occasion with traditional African celebrations, attended by 200 people, received valuable endorsements from UN officials, including Prof Kazuhiko Takemoto (Director of ESD, Institute of Advanced Studies, United Nations University, Tokyo). The book examines how resilience may be created within our world’s web of ecological, socio-economic and cultural systems. Documenting emerging trends and future pathways for the conservation and sustainable development movement post Rio+20, it arrives at diverse but connected conclusions and questions related to the resilience of people and planet. Moreover, reflections about education and its contribution to sustainable development underpin most of its chapters. Dr Blewitt is Co-Director of MSc Social Responsibility and Sustainability, Aston University, and a member of the IUCN Commission on Communication and Education. Professor Tilbury is Director of sustainability at the University of Gloucestershire, Chair of the UNESCO Monitoring and Evaluation Group for the DESD (Decade of Education for Sustainable Development) and President of COPERNICUS Alliance of Universities.